A tsunami is approaching our health care systems. Adults aged 65 and older are the fastest growing demographic, and this will inevitably place strain on acute and long term care facilities. A prepared and specialized workforce is needed to address this crisis. For registered nurses (RNs) who are the leaders of direct care teams, being fully prepared to handle the specialized and unique need of elders is critical. Board certification is tangible evidence of professional clinical expertise. Less than 1% of all nurses have achieved board certification in gerontological nursing by the American Nurses Credentialing Center (ANCC). Gero Nurse Prep is an online course designed to prepare nurses to achieve this credential. Founded as a live program in collaboration with the Robert Wood Johnson Foundation and local healthcare partners in 2009, the online course was created two years later using the certification exam outline to expand the knowledge, skills, competencies, and professional growth of registered nurses (RNs) from generalists to specialists in the care of elders. Anyone with a computer can access Gero Nurse Prep, 24x7. Gero Nurse Prep is a self-paced 10 module online course that nurses can complete on their own time within the comfort of home. Conveniently divided into easy to digest sections, allows the RN to move through Gero Nurse Prep as his or her schedule allows. Nurses experience a significant increase in knowledge, even those who have been working with elders for years. 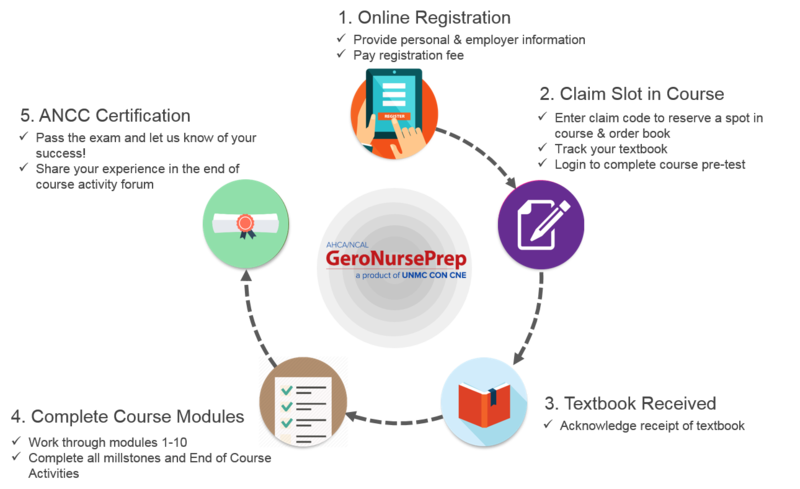 As an added benefit, Gero Nurse Prep contains four sections designed to prepare the RN to pass the ANCC certification exam by teaching master test breaker skills and providing scores of example test questions. There is even an exam simulator to help build confidence! Gero Nurse Prep has a successful track record, operating over 5 years and maintaining a 96% pass rate on the certification exam.